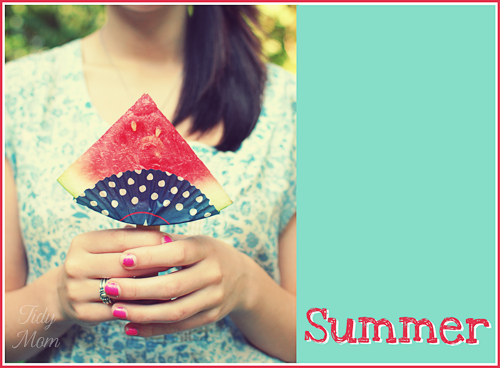 Sit back and enjoy summer with watermelon on a stick, recipes, coolers, cookies, popsicles, salsa and salad and more. I think watermelon is one of nature’s most perfect foods! The luscious lime green and white rind with a juicy deep red inside….even the seeds are cute. Beautiful, perfectly sweet and juicy, that’s hard to beat! This heavenly fruit is a summer icon and can be found in our fridge most of the season. 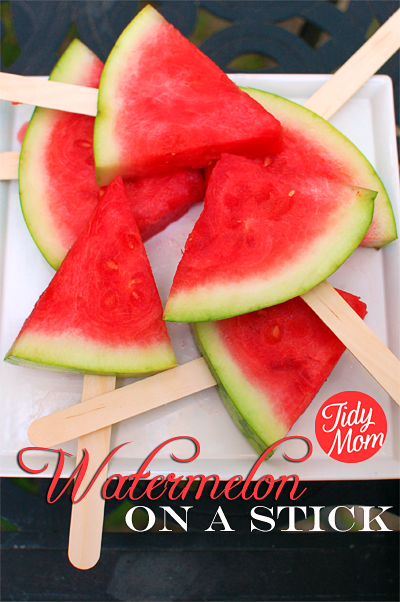 I love to save time, by just cutting wedges and putting them on a stick for easy eating! I think the day I first saw seedless watermelon at the store, my heart skipped a beat! As cute as those little black seeds are, they’re also so annoying! Spitting seed out is not lady like, and picking them out, well that just takes time. Either way, seeded or seedless, I’ll take it, as long as it’s sweet, ripe and cold. 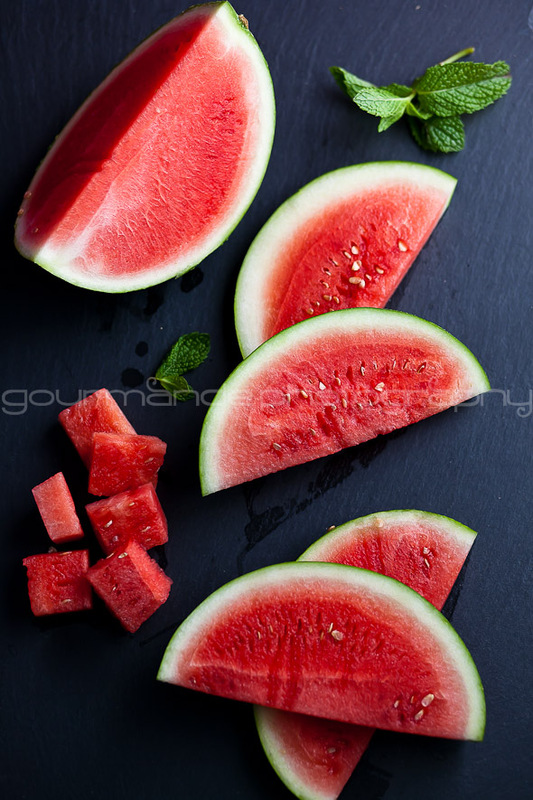 If you’re like me, and have trouble picking out the best watermelon, my friend Sylvie has a great post on picking the perfect melon. 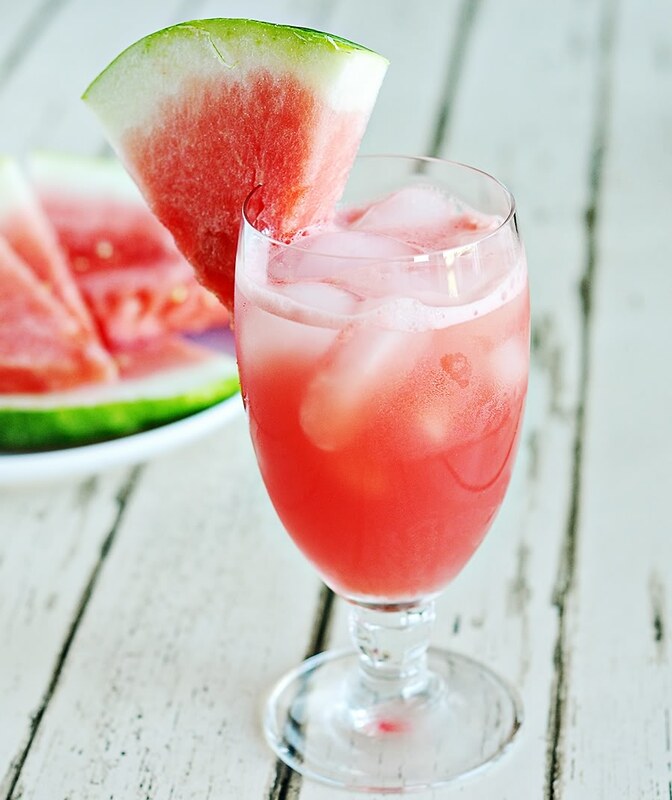 How perfect would Kristen’s Watermelon Cooler recipe be for any summer soiree? 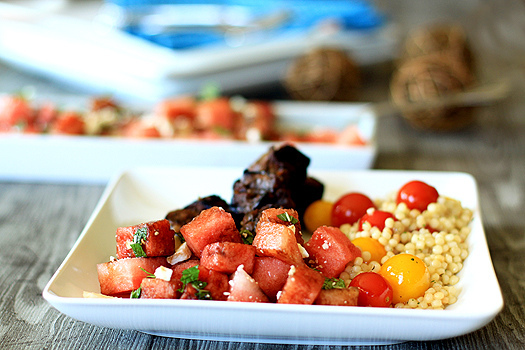 I’m really intrigued by this Watermelon Feta Mint Salad Katie suggested for your next BBQ. 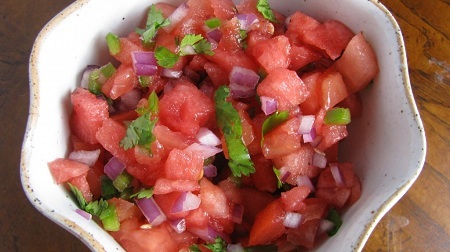 Another sweet and salty combo I think I need to try is Watermelon Salsa from How Sweet It Is. 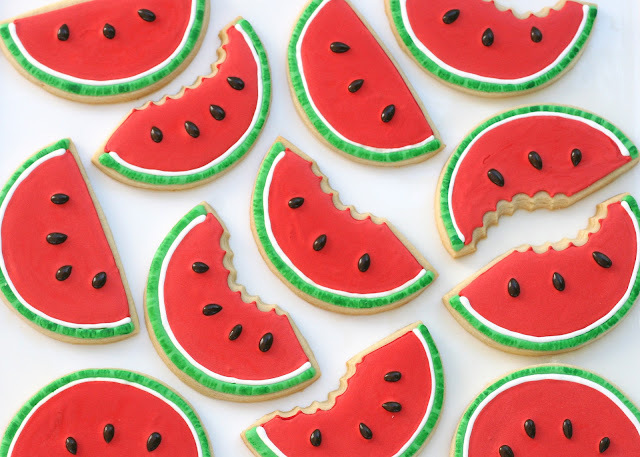 Sit back and enjoy a slice of summer with these Watermelon (shaped) cookies from Glorious Treats. Can you say pool party? 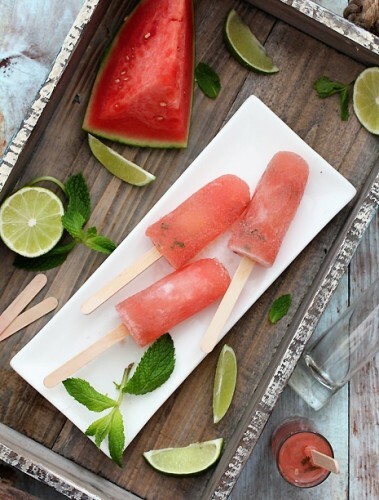 ahhhh, Naomi’s Watermelon Mojito Popsicles would be a HUGE hit, wouldn’t they? 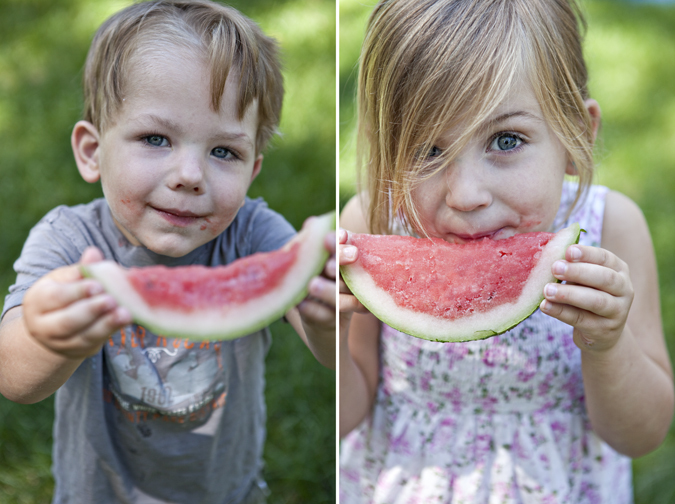 The only thing better than a slice of watermelon on a hot day is Watermelon Lime Sorbet, served in the rind! And by the looks on Shaina’s kid’s cute faces, I think they agree!! There are lots of refreshing watermelon recipes and ideas at the National Watermelon Promotional Board. 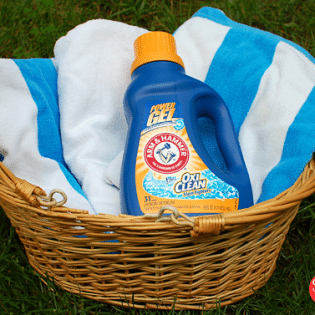 Summer Fun with Redbox – Who’s the best gammer in your house?